I’m hosting an online Pampered Chef party…for only a few more days! 🙂 (through 1/27). To celebrate, I’m featuring some of my favorite Pampered Chef items here on Suzanne Shares. Missed previous posts? Read all of them including my 11 favorite Pampered Chef items here. When I had a Pampered Chef party last year, one of the Host Gifts was the White Ceramic 10″ Saute Pan at a discounted price. As I was closing out the show and finalizing all the orders with my friend, Aimee, Pampered Chef Consultant Extraordinaire, she asked if I wanted to buy it. I had looked at it and decided that I would pass. However, she started raving about it, and I listened. *Uses it to warm up leftovers at lunch for her son. *Can clean it in about two seconds by simply wiping it with a dishcloth. 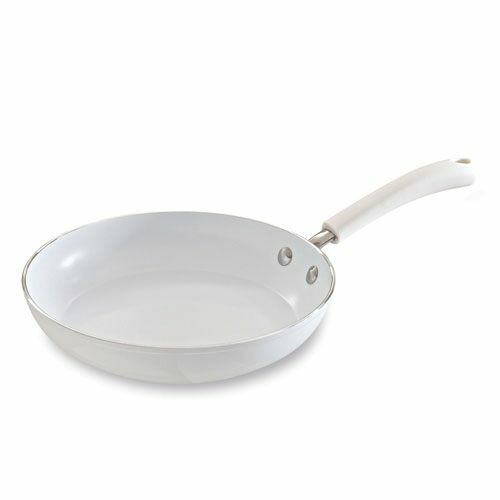 So, I took the leap, I bought the White Ceramic Saute Pan, and IT IS AMAZING! Seriously, I use it more than any other pot or pan I own! My friend’s summary of the pan was spot on! We hardly ever use our microwave anymore. I warm up our leftovers at lunch in the pan, and everything tastes like I just made it at that moment! I can also warm up a variety of leftovers at the same meal because clean up in between the various dishes is so easy. Now, go order yours! You’ll be glad you did! The 10″ Saute Pan is item #3131, or the 8″ Saute Pan is item #3130. Or, check out the other White Ceramic pots and pans here.